CHECK OUT THIS ONE-OF-A-KIND CHARMER! 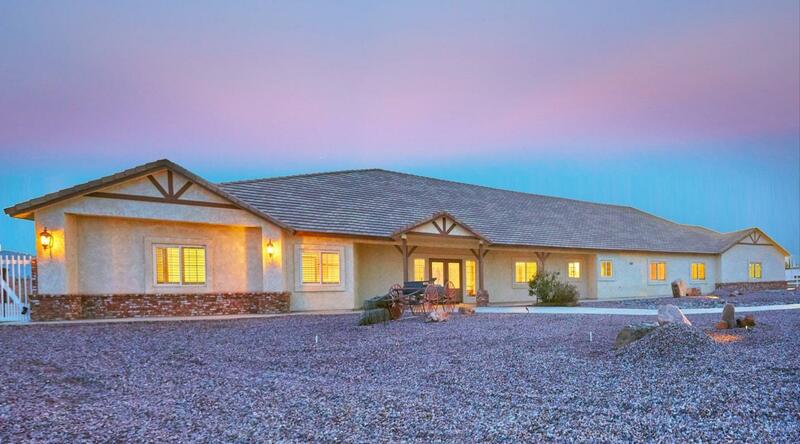 6 Bedroom 5 1/2 Baths 6468 SF home on a paved road in Oak Hills. No corners were cut on building this home. It has a split floor plan, 2 master bedrooms, each master has two 100 sf walk-in closets. The kitchen is amazing, real hickory cabinets and is equipped with Viking appliances which include a built-in refrigerator, ice maker, trash compactor, Large island with vegetable sink with garbage disposal, dual dishwashers, 6 burners full range, dual ovens, a microwave, and granite countertops. The home was built with 2 X 6 construction, has a tile roof, fire sprinklers, all interior walls are insulated, extra electrical sockets, wired for internet and surround sound, has an intercom system, alarm system, a grand fireplace with an insert and a solar system. 3 AC units. It has a 4 car attached oversized garage, a 2000 sf detached double RV garage fully insulation, matches the house, 14x14' garage doors insulated, shop alarmed, 220V, 40 amp. Separate 40 gal electric hot water heater, separate subpanel, 16' ceiling with a bedroom and bathroom and an unfinished room/office. There is a potting shed and multiple covered patios. This property is completely fenced with block walls for extra privacy and vinyl fencing in the front, and easy to maintain landscaping. You won't find another one like it! !